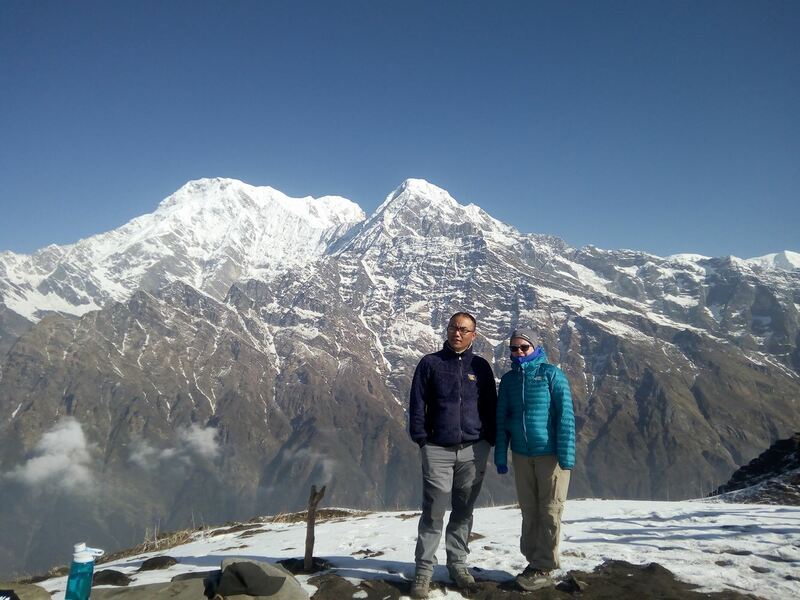 Explorer Adventure offers a pleasant country walks where all age groups and interested people from veteran trekkers to beginners can join in this marvelous Annapurna Mardi Himal Trekking which leads you in sheer wilderness with daily views of Annapurna Himalaya on a week duration adventure. 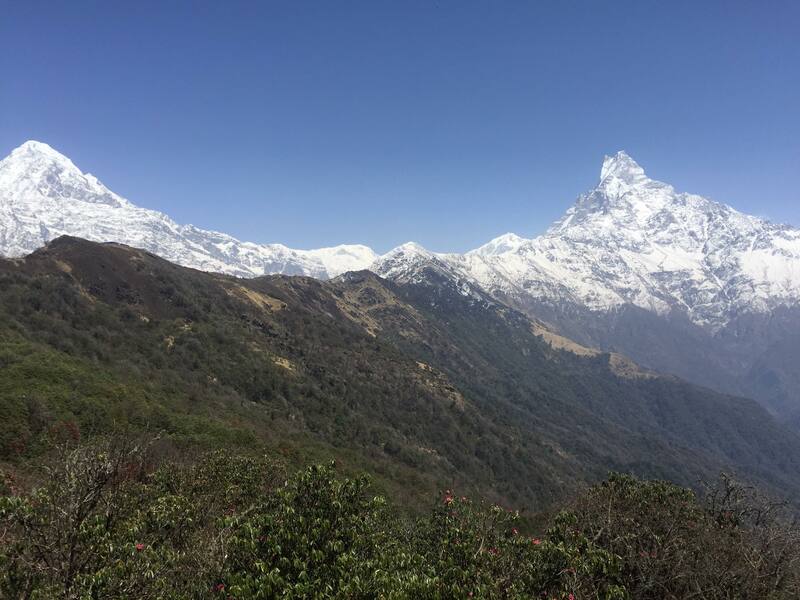 Annapurna Mardi Himal located just a mere distance from scenic Pokhara a popular and leading city and touristic destinations where all treks and adventure around Annapurna starts and ends on this beautiful Pokhara situated on the laps of Annapurna Himalaya with calm serene lakes. 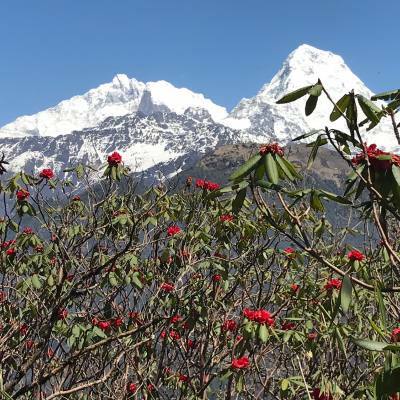 A moderate walks with touch of high altitude which makes Annapurna Mardi Himal trekking adventurous, as this beautiful journey leads you on high hills and ridges covered with dense rhododendron (national flower of Nepal), oaks, magnolia, hemlock and pine tree lines with other rich vegetations. As our adventure progress leaving the lush green tree lines disappears for smaller alpine shrubs and dwarf rhododendron (azalea)into exposed areas at High Camp and beyond at Mardi Base Camp the highest point of the trek above 4,500 m high standing beneath towering Mt. Machapuchare ‘Fish Tail’ and Mardi Himal which is Southern West flank of Fish Tail peak. Starting Annapurna Mardi Himal from Pokhara with short drive heading towards high hills to reach at Dhampus and Potana villages inhabited by Gurung the hill tribe of Annapurna Himalaya, walk leads into beautiful forest with views of Annapurna and Manaslu Himalaya including Machapuchare and small rocky and ice peaks of Mardi Himal. After days of good walk leaving the mainstream trekking trails entering into remote and isolated areas to reach our final destination at Mardi Himal base camp with breath-taking panorama of mountains that surrounds this high scenic ridge facing towering peaks of Machapuchare directly towards north with Mardi Himal. 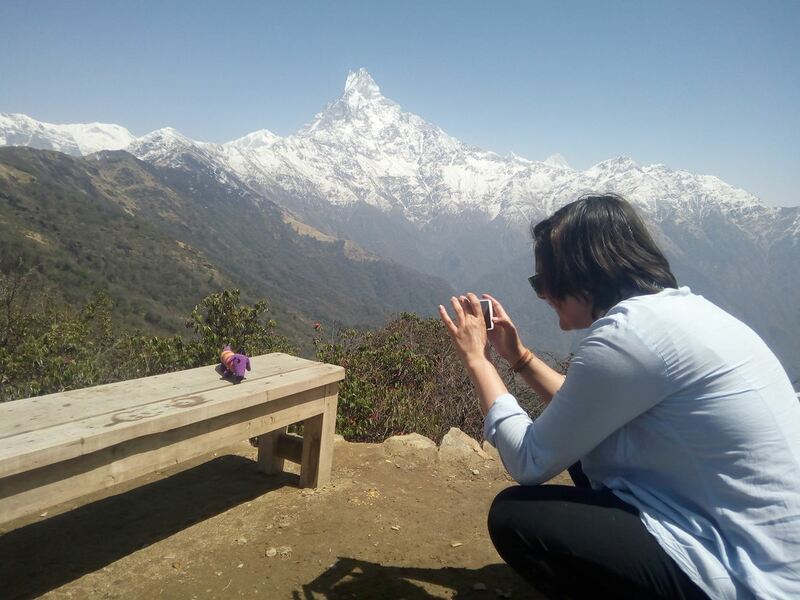 Enjoying glorious and grandeur views of dramatic scenery of mountains and landscapes heading back to Pokhara taking an alternative route past Jungle and Low Camp towards low warm country of paddy fields and terraces for short exciting drive back to Pokhara with magnificent adventure on Annapurna Mardi Himal Trekking. First check into your hotel rooms on getting refreshed from the flight and with Jet-Lag, then join with other members of Annapurna Mardi Himal trekking for group briefing, where our expert guides will inform regarding your stay in Nepal, hotels, trekking, local lodge and overland drives with do’s and don’ts information, evening welcome group dinner in authentic Nepalese restaurants with Folk cultural programs to entertain you during your meals. to reach our starting point of Annapurna Mardi Himal trekking. magnificent Machapuchare peak ‘Fish Tail’ including Mardi Himal. 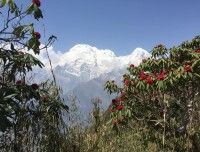 grand views of Machhapuchare Himal and other series of peaks. 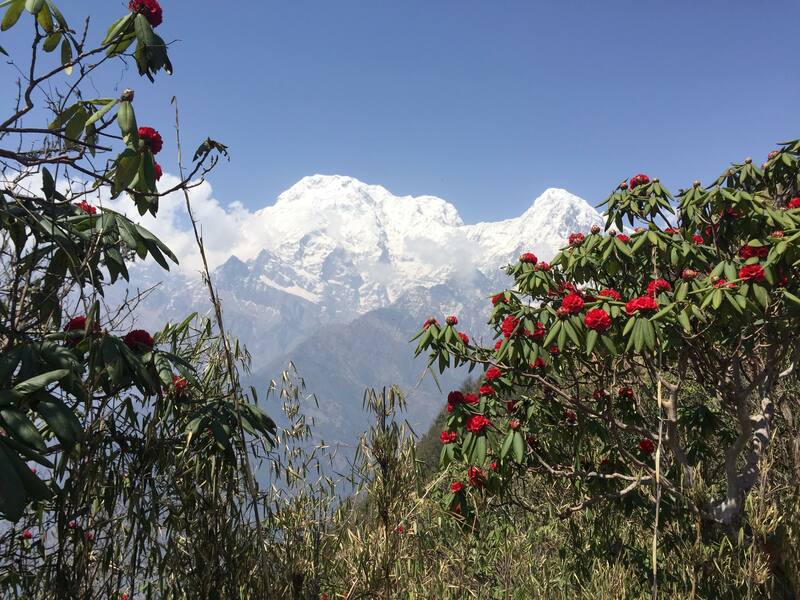 5 Day 5: Trek to Kokar Forest camp 2,520m via Pitam Deurali 2,100m - 05 hrs.After a pleasant overnight stop at Potana with fabulous views, walk continues on main trail reaching at a hill top at Pitam Deurali, offering superb views of landscapes and snow peaks. 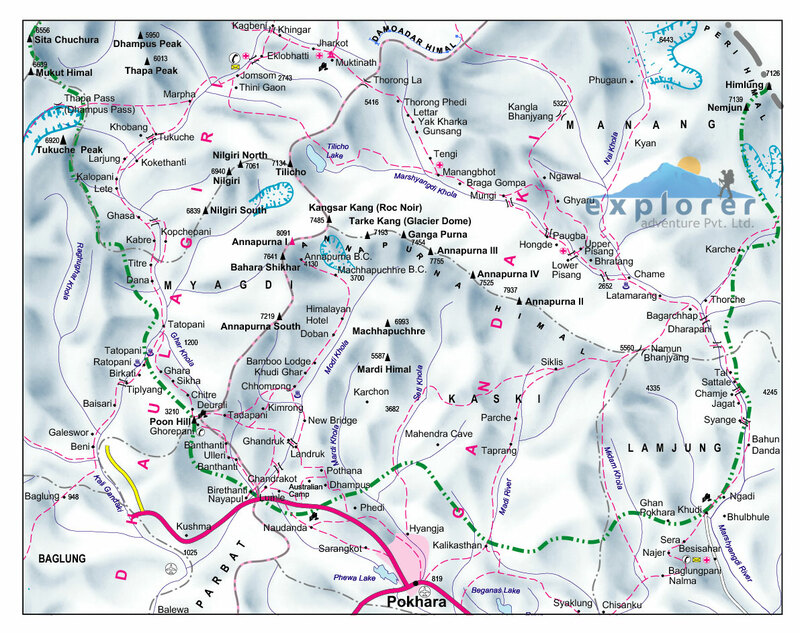 6 Day 6: Trek to Badal Danda / Low Camp 2,970 m - 05 hrs. 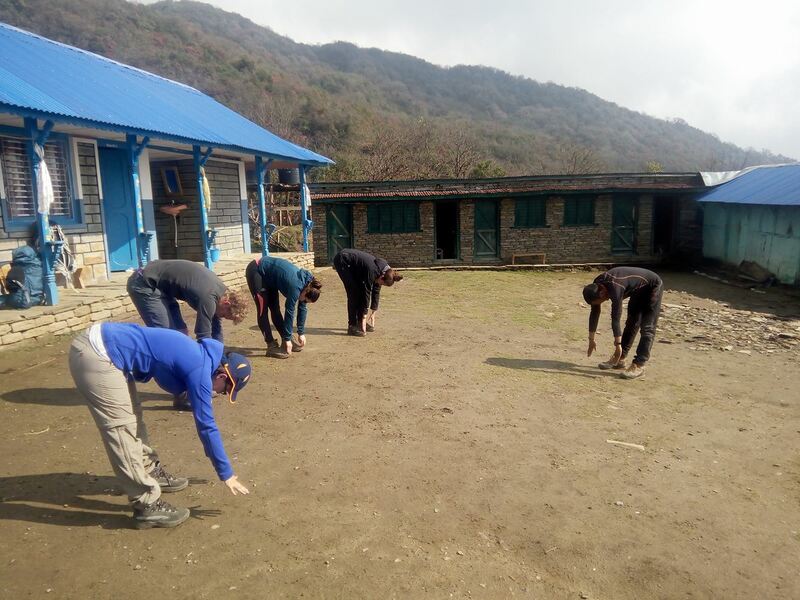 From the Forest Camp, morning walk leads higher on uphill path with steep climb to reach a pasture land for overnight stop on route Mardi base camp at Badal Danda, a high ridge with couple of nice simple lodge facing super views of surrounding landscapes and mountains at close range. 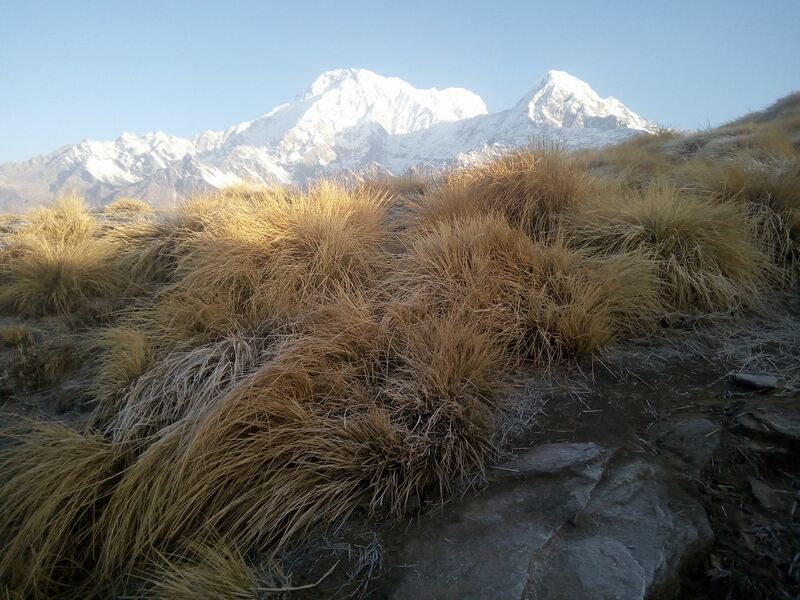 7 Day 7: Trek to High camp 3, 700 m - 05 hrs.This wonderful area offering grand vista of beautiful landscapes and snow-clad peaks in perfect tranquility heading higher to reach at High Camp as the air gets thinner and cooler with steep climb to reach at High Camp where tree lines fades to short rhododendron and juniper bushes. 8 Day 8: At High Camp for hike to Mardi West Base Camp 4,500m. 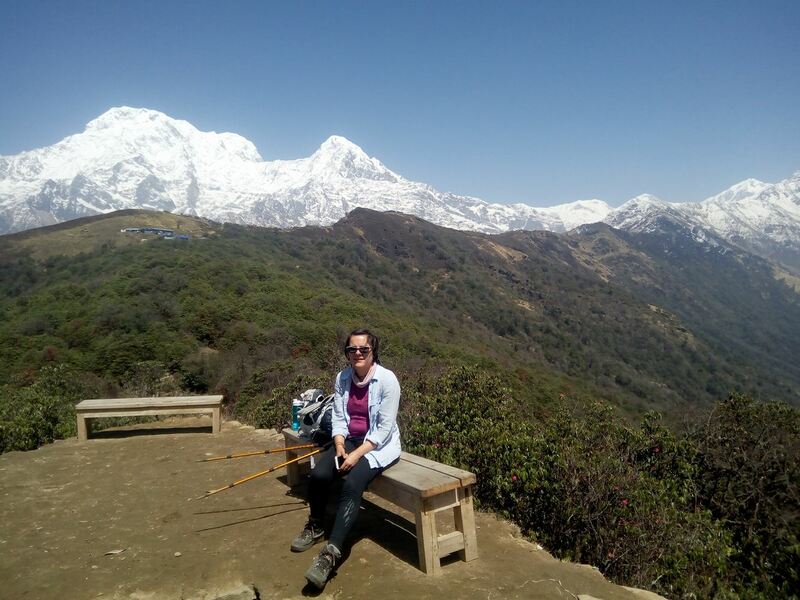 Here with another night stop to explore beyond High Camp with day hike to Mardi Himal leads you towards high ridge on the highest point of the trek above 4,500 m.
Walk leads to a steep climb along a ridgeline to reach a hidden plateau at the base of Mardi Himal South Face with towering Mt. Machapuchare; this area known as 'Other Sanctuary' named by early pioneer Jimmy Roberts, when he first explored this area in early 1970's. After enjoying the views of super mountain panorama return back on same route to our overnight stop. 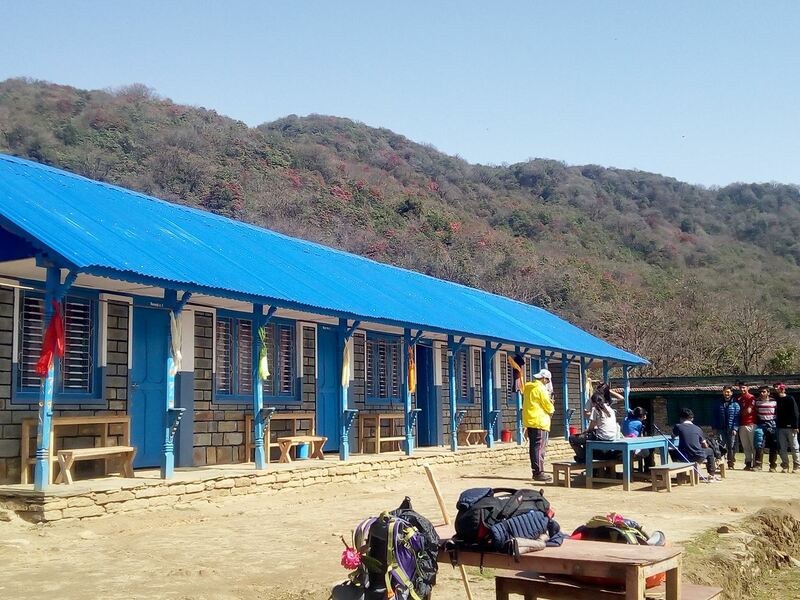 9 Day 9: Trek to Siding village 1,750m | 5,740ft - 06 hrs.After a fabulous time on the high ridges of Mardi Himal with beautiful views and back into forest of rhododendron and pines trees, retracing the journey back on same trail at Jungle Camp and beyond with more downhill walk to reach at Sidang village located between the junction to another East and West route to Mardi Himal on warmer area for overnight stop before ending this lovely trek next day. 10 Day 10: Trek to Lwang village 1,230 m - 04 hrs.From Siding village morning walk leads within warm farm country by the side of Mardi River as our route leads past scattered farm fields and smaller villages to reach at Lwang nice community run villages with home stays for visitors. 11 Day 11: Trek and drive to Pokhara via Mardi Pul - 04 hrs.Morning catch the fantastic views of snow clad peaks, our last day takes you on a drive to reach Pokhara, journey leads past Mardi Pul with views of mountains on route Pokhara, where our wonderful Annapurna Mardi Himal Trekking completes at picturesque Pokhara by the calm lake of Phewa Lake for last overnight stop around Annapurna region. 12 Day 12: Drive or fly to Kathmandu and then transfer to your hotels.Morning transfer into a vehicles either by car-coach or in tourist bus (as per the size of the group), for overland journey back to Kathmandu with scenic views of mountains, green scenery of hills and farm fields within nice villages and towns as drive brings you back at hustle and bustle city life of Kathmandu. 13 Day 13: Depart for international flight home ward bound or to respective countries.Your last memorable day in Nepal after a wonderful experience on Annapurna Mardi Himal trekking with great service of Explorer Adventure, and as per your international flight then transfer to Kathmandu international airport for homeward bound or to your respective destinations. Highest elevation gain: At Mardi Base Camp 4,500m high. People and Culture: Mostly inhabited by Gurung and some Magar tribes of both Buddhist and Hindu religions and varied culture and colorful age-old custom.